Welcome visitors with comfortable sanctuary seating. 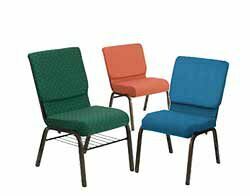 Chairs in church and Sunday school are a modern way to offer seating to your congregation. Create an inviting atmosphere in your church that not only welcomes members into your community but also encourages them to stay. Shop church chairs from BizChair to find a range of sizes, styles and materials to blend seamlessly with your place of worship. Take a look at our most popular styles of church chairs. They are versatile, comfortable and come in a wide variety of colors. 18.5" or 21" Wide? Custom or Standard Upholstery? We will help you make the decision that fits the needs of your style and of your congregation. Do you need to easily transition your place of worship? We have a dolly for any church chair to help rearrange or move around your layout as you see fit. BizChair has a wide selection of church chairs for sale that can improve the comfort level at any church, temple or synagogue. Find out more about our broad array of church seat options. Browse our assortment of church chairs to find features that match your preferences and needs. Keep people comfortable while also being able to fit as many chairs as necessary in your space by choosing upholstered church chairs with or without arms. Church chairs with a 21-inch seat provide a more supportive seating solution, while narrower 18.5-inch seats allow for more room in smaller spaces. To keep worship materials readily available for all churchgoers, browse chairs that include a book rack directly underneath the seat. For a more welcoming seating solution, shop our personalized church chairs. 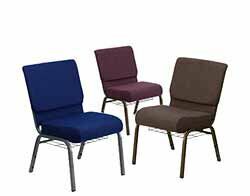 These seating solutions can be customized to include your church’s name, logo or both to provide an extra level of community among members. While you shop, simply add your text, font and thread color to complement the color palette of the church chairs you’ve chosen. 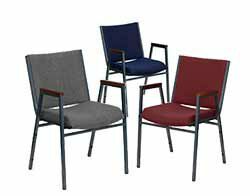 To add a logo, choose from our images or send us your own, and we can embroider it on each chair. 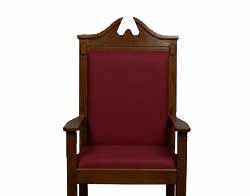 Give the leaders of your church an honorable place to sit with our selection of pulpit chairs. 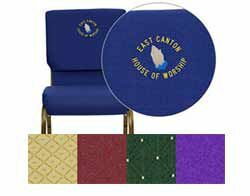 We carry center pulpit chairs and side pulpit chairs in a range of styles, designs and finishes to match your place of worship. Personalize the fabric color and the accent trim wood finishes to fit beautifully among your altar. 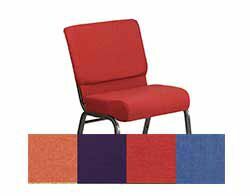 If you need your church chairs fast, browse our assortment of quick ship church chairs. These products are in stock and ready to ship in about one business day, so you can get your order delivered as quickly as possible. To move your church chairs quickly and efficiently, add dollies and carts to your order. 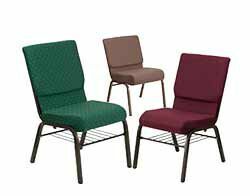 These are ideal for churches that use their worship area as a multifunctional space or are housed in a temporary location. Choose from several available options designed to fit your specific church chair model number. We understand churches, temples and synagogues serve a unique mission in spreading their message to their congregation. BizChair is honored to be a part of that experience by offering quality seating that can enhance a worship session. In addition to our exceptional products, we are committed to providing our customers with outstanding service and efficient delivery. Browse our church chairs for sale to find the best products for your space.